· Context, Strategies, & Objectives: these are the shared perspectives, assumptions, and understanding the organization holds from which they create strategies to achieve certain things via objectives. This covers everything from the mundane through pioneering stuff, and it’s easier said than done, especially as you scale and are located across the world where language and cultural barriers abound. As you encounter greater numbers of adaptive challenges, an organization’s ability to rapidly share information, see patterns, devise strategies and experiments, and create actionable objectives becomes essential to continue making progress. This is often where start-ups struggle as they scale because what was previously done organically and/or via brute force now requires greater coordination and communication. · Structure, Practices, Resources, & Roles: This is the who/what/when/where/how for an organization that enables the achievement of the strategies and objectives. Leaders gravitate to this area because it’s very tangible and often think it’ll solve all ills. 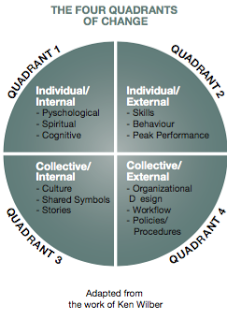 In Wilber’s model it is quadrant 4 for the organization and quadrant 2 for individuals. How you design and evolve these organizational elements should be aligned with your organization’s Why and How layers, and ideally set-up for maximum flexibility. What does that mean? Keep it simple and start with an empirical approach to day-to-day work and process; instead of simply saying this is how we do things, everyone can identify desired qualitative and quantitative measure of success, assumptions, stakeholders, and evaluation timelines so everyone can check-in at certain points to see if actual performance and results matches your hypotheses. Framing things this way – as experiments with hypotheses, assumptions, KPIs, etc. – allow everyone from senior exec to someone fresh out of school to feel comfortable sharing their ideas and perspectives in service of improvement. Often egos get in the way because a person designed the approach, or there’s no organization-wide approach to regular assessments. No one likes to get “feedback” on their area if in turn the provider doesn’t do the same for her/his area. One potentially high ROI option for leaders is to consider a move from people having a job (which really is a remnant of a slower moving, hierarchical era) to having a combination of roles. Assignments would be based on people’s desires to grow, strengths, preferred focus, and of course what the organization truly needs as determined by the employees themselves (or with greater input) versus solely senior management. · Wisdom & Ongoing Learning: An organization’s wisdom is more than just knowledge, tools, or experiences but the application of those in creative ways to more often make better decisions, solve problems, advance organizational capabilities, and deliver results. The ongoing development and application of wisdom, creativity, play, and purpose enable organizations to make progress in their adaptive challenges. This is a huge point for me – if you want resilient, motivated people who can tackle these adaptive challenges people need to feel like it’s a really interesting challenge, and they have to feel like it’s an achievable, worthwhile, energizing use of their skills and heart. It’s why small teams make huge strides – the collective intelligence and capability of the team is elevated when these conditions are present. My hunch is that what we call a learning organization happens because individuals are individually experiencing meaning, autonomy, growth, impact, and true connection (the MAGIC acronym I mentioned earlier), complemented by organizational culture and design (see above) that are designed to emphasize execution, experimentation, and wisdom. Talent functions can enable a learning organization by addressing all four quadrants of Wilber’s model via a deep partnership with line managers. Start with either the Adaptive Flow model, or Wilber’s model, or both, but make sure everyone is conceptually on the same page about what you believe contributes to a learning organization and how to best assess current state. Where you start will vary by organization, stage, deliverables, what’s on fire, etc. but generally speaking I’d start with senior leaders and key influencers and focus on quadrant 1 (individual’s inner game). If these folks aren’t in a learning mindset, or don’t make it safe to experiment or take risks, or even to share knowledge, than it doesn’t matter what else you do in the other quadrants because everyone else is going to model their behaviour after them. In other words, get them to start the learning organization journey by having the very personal experience of being vulnerable and assessing strengths, developmental areas, the impact of those things on company culture and capability, etc. That awareness and commitment can then be used skilfully to help them co-lead the efforts with the talent team to explore and develop the other quadrants in a coherent way. Feel like we’re back at leadership again? Exactly! Helping these folks get motivated by their individual and collective purpose and values (quadrants 1 and 3) are key enables of a growth mindset, but certainly not the most important piece. For that, we need to look at a leader’s stage of development and ego structure (see below). In summary, my advice is to never lose focus on organizational results: ensure Q2 and Q4 (either via training, talent management, or talent acquisition) are functioning but never forgot that Q1 and Q3 (the inner game, individually and collectively) truly are the most important over time. I believe leadership is not a role but a stance in life. It begins when people take responsibility for their life, in all aspects, and develop the capacity to do so with skill and intention. You can have access to the best tech, capital, and customers but your success will be capped if people are disempowered or unwilling to be leaders. It does not matter the role – anyone can lead, and in today’s world it’s essential. I list consciousness as a foundational element because I truly believe that organizational results cannot exceed the collective consciousness of those in power. The folks at The Leadership Circle wisely say “Consciousness is your internal operating system; it’s a structure that interprets the world to you; relates you to the world; is your meaning making and decision making system; and is your self-awareness and emotional intelligence system. If it evolves it does so in stages. In today’s world if you are not actively developing both the inner game (consciousness, insights, and maturity; often this is referred to as vertical development) and the outer game (skills, tangible knowledge; often referred to as horizontal development) then you are missing an opportunity because the inner game always runs the outer game. “ Senior executives and talent professionals must address both the individual and collective intelligence / functioning of the executives if their organization is to sense, learn, and create faster than the competition. Your organizational culture is a shared understanding of group norms fuelled by people’s consistent behaviour shaped by everything in this model. Another way of thinking about culture is the “white space” between these various organizational elements and its stakeholders. Culture is a result of choices, not something you can directly control. It would be inaccurate to say that simply having a playbook creates your culture, just as it would be inaccurate to say we have an innovative culture because you have hack-a-thons. Those things are particles, or elements; the space between those elements, the meaning your people associate with those things, and their subsequent actions are your culture. I disagree with those who say your culture can be summed up with a colour, or that it can be changed simply by channelling more “red” or “orange”. I also take issue with people who say that organizational culture is something to be designed to simply meet product/service/customer experience strategies. Of course you should have a coherent approach to brand, values, and other ways of doing business, but simply approaching your culture as a strategic tool equivalent in impact as say a great project plan or budget misses the point and opportunity with an intentional approach to culture. It’s a way for people to be more alive, more authentic, and to have a tangible way to live their values and desired impact in the world. Although an intentional approach to culture is strategic it will not be effective if there is not personal joy and resonance for stakeholders about their culture and their membership in that tribe. We are incredibly social creatures living in an era where speed and access inadvertently allows people to skip over opportunities for meaning and connection. Culture is one way for people to contribute and to embody their values in very tangible ways and therefore must always be recognized as having its own vital, dynamic nature. It is owned by no one but impacted by all. It’s all four quadrants in Ken Wilber’s model, owned by each and every one in your company. Yes, the HR leader must absolutely be responsible for initiatives and programs that impact culture and leadership but it is never his/her sole responsibility – culture and capability are everyone’s responsibility. Everyplace will be different, so I’m the first to admit that this is just a framework – the real progress will be via the leadership of everyone in your organization. I might suggest taking a step back and asking how your organization is set up to balance execution with experimentation. How vivid and coherent are your organization’s Why/How/What layers and how alive / connected are your people to them? Explore what’s “on fire” or where you consistently see issues and drama. What might be contributing to those things holistically? You might use the Adaptive Flow model to identify and map out the elements that exist and are true. Get people from across your organization for this assessment, especially the people who see things differently than you. This is not a beauty contest – be clear eyed about this stuff, without blame, and you’ll then be able to see what needs to be clarified, linked, changed, and prioritized, and how those elements (mis)align with each other and your employee population’s Why/How/What. This then becomes your framework for continuously investing in and tuning your organization for maximum adaptability. A word of advice – many of your colleagues will view this as a checkbox of quick deliverables, not something to be addressed and evolved as an organization over time. People of all backgrounds and pay levels have to view themselves as leaders capable of owning their organization’s culture and capability, and they must be allowed to lead. It’s not an HR program, although HR people will have responsibility for key program elements. Getting to this point has been a lot of fun. I love to learn, and writing is a fun creative outlet. My hope is that friends and colleagues will help me improve this framework, share ideas, and experiment with these practices in their organizations. I look forward to learning with you, helping you, and continuing to have fun pushing boundaries.